Gerry Gordon's Mazda | Get the 2018 Mazda MX-5 today! Offer available on retail leases of new 2019 CX-3 GX (HVXK69AA00)/2019 CX-5 GX (NVXL89AA00)/2019 CX-9 GS (QVSM89AA00) with a lease APR of 2.49%/3.90%/1.95% and 130/130/130 bi-weekly payments of $130/$181/$219 for 60/60/60 months, the total lease obligation is $16,912/$23,496/$28,415, including down payment (or equivalent trade-in) of $0/$0/$0. First monthly payment is due at lease inception. 20,000 km per year mileage allowance applies; if exceeded, additional 8¢ per km applies (12¢ per km for CX-9 models). Offers excludes taxes. Offered leasing available to retail customers only. Based on a representative example using a finance price of $17,471/$21,471/$28,921 for the 2018 Mazda3 GX (D4XK68AA00)/2018 Mazda3 Sport GX (D5XK68AA00)/2018 Mazda6 GS (G4SN88AA00) at a rate of 1.49%/1.49%/1.49% APR, the cost of borrowing for an 84-month term is $938/$1,153/$1,552 weekly payment is $51/$62/$84, total finance obligation is $18,409/$22,624/$30,474. Taxes are extra and required at the time of purchase. As shown, price for 2018 Mazda3 GT (D4TL68AA00)/2018 Mazda3 Sport GT (D5TL68AA00)/ 2019 CX-3 GT (HVTK89AA00)/2018 CX-5 GT (NXTN88AA00)/2018 Mazda6 GT (G4TM88AA00)/2019 CX-9 GT (QXTM89AA00)/2018 MX-5 GT (L2TK68AAOO)/2018 MX-5 RF (L3TK68AA00) is $26,221/$27,221/$33,116/$37,571/$38,171/$50,971/$41,667/$44,665. Licence, insurance, taxes and down payment (where applicable) are extra and may be required at the time of purchase. Dealer may sell/lease for less. Dealer order/trade may be necessary on certain vehicles. Unless otherwise stated herein, offers valid February 1-28, 2019, while supplies last. Lease and finance on approved credit for qualified customers only. Offers subject to change without notice. 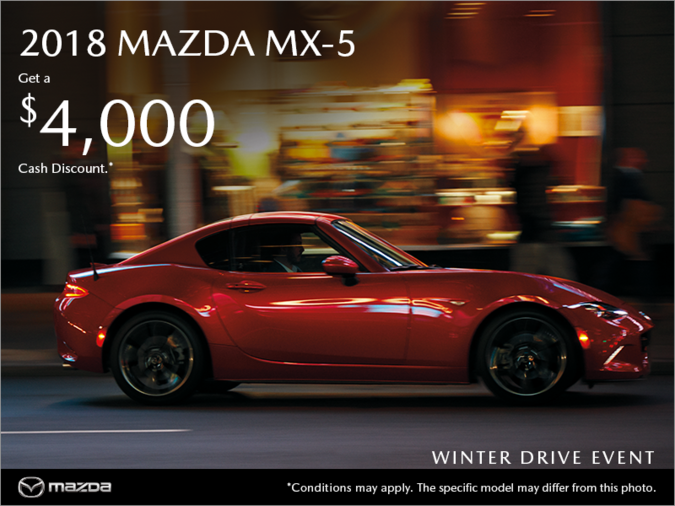 Visit mazda.ca or see your dealer for complete details."